You can use your own letterhead or have the Tenant File print your company information at the top of your reports for you. Enter the information once and forget it. This is where you will enter information about your own business, whether you are a property management company or manage your own rental properties. This information will be used throughout the Tenant File software, such as the 'heading' that prints on reports. The 'FROM' email address is the address that will be used when you are sending emails from the program. If you want to have different headings on some reports, you can set up two other companies, and switch to that heading when in the report screen. Simply enter the information and it will be saved for you. 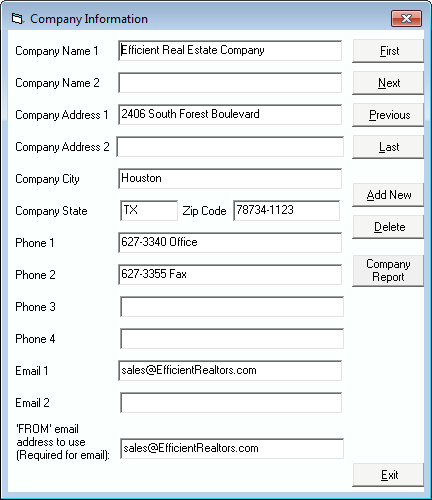 It is easy to add or delete the companies that you have set up, or to move from one company to another. For a report that totals account categories for a company report, simply click the 'Company Report' button.